A British Military Working Dog (MWD) who helped save the lives of troops in Afghanistan has received the prestigious PDSA Dickin Medal* – the animal equivalent of the Victoria Cross. 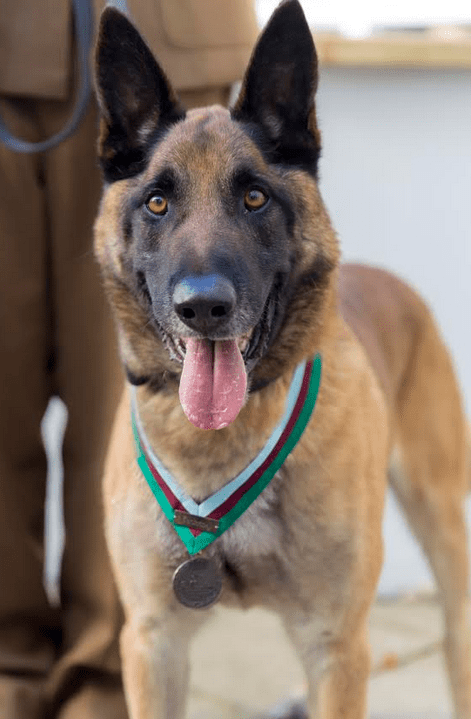 Mali, a Belgian Malinois, has been recognised for his heroic actions during a highly sensitive military operation in 2012, where he assisted an assault force in securing a key enemy stronghold. The medal was presented by the UK’s leading veterinary charity, PDSA, on Friday 17 November – the 100th anniversary of the charity’s inception. A presentation ceremony, held at The People’s Palace, London, was attended by Mali and his current handler, Corporal Daniel Hatley. Mali’s ‘awesome ability and determination’ were praised by PDSA Director General, Jan McLoughlin, who declared the dog ‘an incredibly worthy recipient’ of the medal. The globally famous medal was introduced by PDSA’s founder, Maria Dickin CBE, in 1943. It is the highest award any animal can achieve while serving in military conflict. Mali’s PDSA Dickin Medal is particularly unique because it bears a commemorative ‘Centenary’ bar, to mark its presentation on the charity’s 100th birthday. Eight-year-old Mali, who is attached to the Royal Army Veterinary Corps (RAVC), is trained to sniff out explosives and detect insurgents. His expertise during one particular operation was vital in helping the UK forces and its allies secure a key enemy stronghold amid sustained fire. MWD Mali, was part of a British military unit deployed to Afghanistan in 2012. During his tenure, Mali assisted in an operation to secure an enemy stronghold, situated in a multi-storey building. The significance of his actions during this seven-and-a-half-hour mission saw him perform above and beyond the call of duty on numerous occasions. Mali was sent through direct fire on two separate occasions to conduct searches for explosives. He also indicated the presence of insurgents numerous times, giving the assault force vital milliseconds to engage the enemy in close quarter combat. During the operation, Mali was hoisted up the outside of the building several times to provide the assault force with a key foothold to attack the insurgents. In the melee that took place, the assault force sustained casualties. Mali was also seriously injured by three grenade blasts: the first two explosions caused injuries to his chest, front and rear legs. A further blast detonated close to his face, causing the loss of Mali’s front tooth and damage to his right ear. Despite his injuries, Mali continued his duties and pushed forward, remaining close to his handler. He played a key role in breaking the stalemate that had begun to develop in the building, providing impetus for the host nation and UK forces to continue to fight and bring about a successful resolution. Mali displayed outstanding courage in the face of fire. There is no doubt that his actions throughout the operation were pivotal in the success of breaking an enemy stronghold, helping to save multiple lives and prevent further injury. Mali’s gallantry and devotion to duty makes him a worthy recipient of the PDSA Dickin Medal. Mali’s handler at the time, whose identity has been protected for security reasons, was awarded a gallantry medal for this action during the operation. After receiving emergency treatment for his injuries, Mali returned home from Afghanistan, where he made a full recovery. Although retired from front line duties, Mali continues to work at the RAVC’s Defence Animal Centre in Leicestershire, where he and his current handler, Corporal Daniel Hatley, help to train new dog handlers. Brigadier Roly Walker, Head Army Strategy and Colonel Commandant of the Royal Army Veterinary Corps (RAVC) said: "As long as we’ve had soldiers, we’ve had animals; and I think we always will have them. “Today’s award of a PDSA Dickin Medal to Mali recognises this unique bond. It comes as the Royal Army Veterinary Corps prepares to mark the centenary anniversary of its Royal Charter, a reflection of the historic service and heroism of military working animals and their handlers in war. The PDSA Dickin Medal is a large, bronze medallion bearing the words “For Gallantry” and “We Also Serve” all within a laurel wreath. The ribbon is striped green, dark brown and sky blue representing water, earth and air to symbolise the naval, land and air forces. The presentation ceremony was held within The People’s Palace, east London, just a few yards from the site of PDSA’s first ever permanent dispensary, on Harford Street.